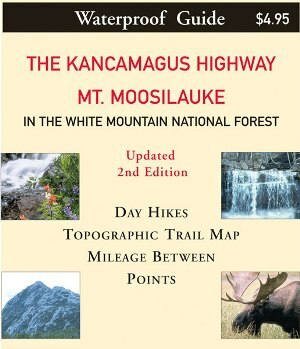 Kancamagus Highway Pocket Map & Guide by Map Adventures, 2005. Pocket-sized waterproof contour map shows hiking trails, overlooks, campgrounds and other features along the "Kanc." Covers about 5 miles on either side of highway, with scale of 1:80,000. Also includes trail map of Mt. Moosilauke. Hike descriptions on reverse. 24" x 9", folded to 4" x 4 1/2".